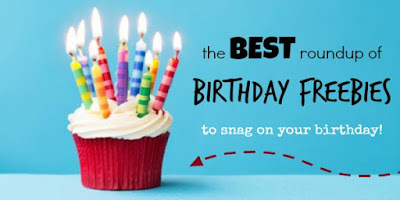 mommy's reviews: FREE Stuff and Deals for Your Birthday!! Get a FREE Summer’s Eve Product on Your Birthday when you sign up for their deals and news program. On your Birthday they will send you an email to print out a coupon for a free full size product. 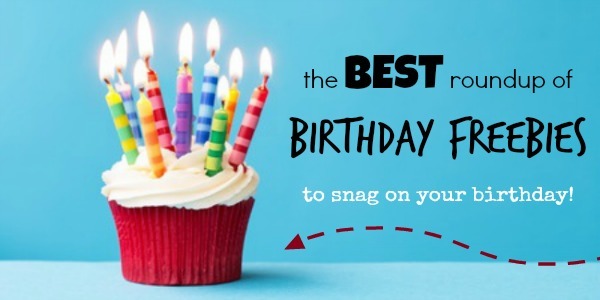 Get 100 FREE Disney Reward Points for your Birthday! Disney will send you an email to redeem the points. Save $1.50 off ANY John Frieda Hair Care‏ Product when you sign up for the John Frieda Elite Club. To get a FREE Burger at Ruby Tuesday on Your Birthday you just need to sign up for their newsletter. You will recieve your free coupon around one week before your Birthday and the coupon is valid for 2 weeks. Get a FREE Fish Meal at Captain D’s on Your Birthday when you sign up for their D‘s Club. This offer is valid for 2 weeks after your birthday! Get FREE Kids Meal at Captain D’s on their Birthday! Get a FREE Starter at Buffalo Wings & Rings when you sign up for their email club. You will also get a 5 FREE Wings on your Birthday and on your one year anniversary from when you signed up! Also throughout the year Buffalo Wings and Rings will send you “Club 84 member appreciation”‏ emails for FREE wings throughout the year just for being a member. To get a FREE L’Occitane Gift During Your Birthday Month you need to register for their newsletter, if you are already a member you just need to add your Birthday to your account. Also throughout the year L’Occitane offers exclusive coupons, deals and more. To get FREE $3 Credit & FREE Smoothie or Juice on your Birthday at Jamba Juice Signup for Jamba Insider Rewards you will FREE $3 Credit & FREE Smoothie or Juice on your Birthday just for joining! Get a FREE 2.5 oz Ice Cream Scoop For Your Birthday at Baskin Robbins! Sign up now and you’ll get your FREE ice cream email five days before your birthday. You’ll also receive a discount on a birthday cake. Plus a BOGO scoop offer when you sign up and additional offers all year long! To get a FREE Pastry or Sweet at Panera for Your Birthday you need to sign up for the Panera card breads program. The FREE Pastry will be loaded on your card 5 days before your Birthday and is valid for 60 days unless otherwise noted. To get a FREE Spaghetti Entree and Spumoni Sundae at Spaghetti Warehouse on Your Birthday you need to sign up for their email updates. Your coupon will come via email one week before your Birthday and is valid for one month. To get a FREE A&W Root Beer Float for Your Birthday you just need to join the Mug Club. *You must be 13 years or older to join the Mug Club. Get FREE Dippin Dots During Your Birthday Month when you sign up, plus you will receive exclusive offer throughout the year sent straight to your email inbox. Get a FREE MochaLatta Chill For Your Birthday at Cinnabon when you sign up for their email updates. You will get the coupon 2 weeks before your Birthday and the coupon is valid for 2 weeks. Also when you sign up you will receive aFREE MINIBON Cinnamon Roll at Cinnabon Stores! Get a FREE Sub at Firehouse Subs On Your Birthday! Just show an I.D. with your birth date on your birthday and you’ll get a FREE medium celebratory sub. When you join the Aveda Birthday Program you get a free customized gift (valued up to $25). Aveda also wants to celebrate your birthday by giving you a complimentary Personal Blends, Pure-Fume Spirit or body care product ($25 value) custom blended with the aroma of your choice. Aveda’s Pure-Fume™ aromas are powered by pure essential oils, and 90% of them are certified organic. Get a FREE Chili Dog at Wienerschnitzel when you sign up! You will get a welcome email with your coupon included. You will also get a FREE Corn Dog on your Birthday. Get a FREE Brownie Sundae at Buca Di Beppo For Your Birthday when you sign up for their email newsletter. They will send you a coupon 2 weeks before your Birthday via email. The coupon expires 30 days from when the coupon was sent. You will also be sent exclusive coupons throughout the year to your inbox. To get a FREE Doughnut and Beverage at Krispy Kreme for Your Birthday sign up for their newsletter. You will then receive an email one week before your birthday and the coupon is valid for 2 weeks. Get a FREE Burger During Your Birthday Month at Red Robin when you sign up. Also when you sign up you will receive special offers and great deals throughout the year. Join the Au Bon Pain eClub to get a FREE Travel Mug, Birthday Lunch, Anniversary Gift and Exclusive Offers! To get a FREE Bowl (up to $9) at Noodles & Company on Your Birthday you just need to sign up for their e-club. To get a FREE Fajita Taco at Taco Cabana you need to sign up and they will email the coupon. Your coupon is valid for one week after your sign up. You will also receive a FREE Flauta Plate at Taco on Your Birthday. The coupon is valid for one week. Sign up to get FREE Large Fresh Cut Seasoned Fries On Your Birthday at Wingstop! Plus throughout the year Wingstop offers exclusive coupons that they send straight to your email inbox. Get a FREE Scoop of Ice Cream at Ben & Jerrys For Your Birthday when you sign up for their newsletter. The coupon will come via email one week before your Birthday and is valid for 2 weeks! Also throughout the year Ben & Jerry’s will send you exclusive coupons straight to your email inbox. Get a FREE Meal at Rubio’s on Your Birthday when you sign up for their email club at the top of the page. They will send you a coupon via email about 2 weeks before your Birthday. Also throughout the year Rubios offers exclusive free offer for members. To get a FREE Dessert at Mimi’s Cafe For Your Birthday sign up for their newsletter. You will then receive an email one week before your birthday and the coupon is valid for 2 weeks. To get a FREE Buffet on Your Birthday at Stevi B’s join the Stevi B’s Birthday club. To get a FREE Dessert on Your Birthday at Macaroni Grill you need to sign up for their newsletter. 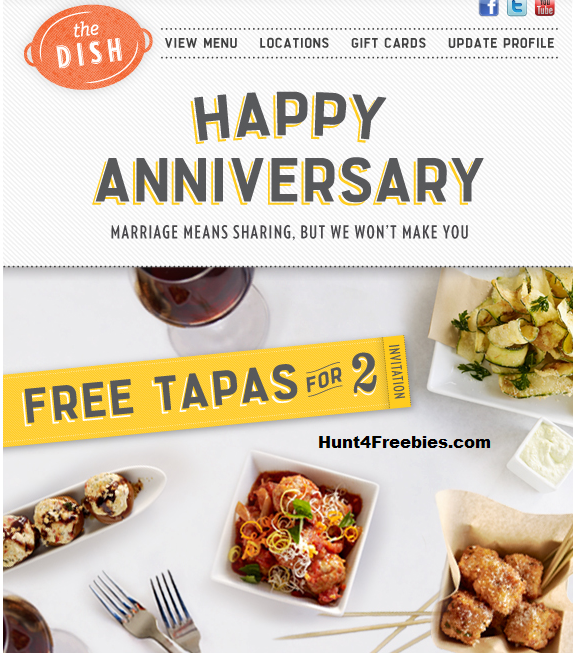 Also they will send you a coupon for a FREE Dessert on your Half Birthday and they will send you a coupon for FREE Tapas for 2 on your Wedding Anniversary! Get a FREE Birthday Treat at Rita’s Italian Ice on Your Birthday! Join today and receive exclusive offers year round, a FREE birthday treat and the latest scoop on Rita’s– all delivered straight to your inbox. To get a FREE Magnificent Seven For Your Birthday at Perkins you just need to sign up for their newsletter. You will receive your coupon one week before your Birthday and the coupon is valid for 3 weeks. Also throughout the year Perkins will send you exclusive coupons straight to your email inbox. Get a FREE Drink at Starbucks on Your Birthday when you register your Starbucks Card! You can pick up your physical card in-store. Also when you join the rewards program you can earn rewards, like free drinks and food. To get 5 FREE Wings at Buffalo Wings & Rings On Your Birthday you need to sign up for their email updates. Get a FREE Sandwich or Salad at Au bon Pain For Your Birthday when you sign up for their email updates. You will receive your coupon via email 2 weeks before your Birthday and the coupon will expire on your Birthday. They will also send exclusive coupons to you throughout the year. Get FREE Kids Meal at Captain D’s on their Birthday when you sign up for their Kids Club. He or she will receive a special birthday greeting and a FREE Kids Meal on their birthday. The Kids Birthday Club is only available for kids 12 years of age and younger. Sign up to receive a FREE Pretzel On Your Birthday at Auntie Anne’s! Get a FREE Shake at Arby’s with any purchase when you sign up for their newsletter. Get FREE Dessert w/ purchase On Your Birthday at Applebee’s when you sign up! Get a FREE Side Kick of Ribs or Appetizer at Texas Roadhouse with purchase when you sign up for their newsletter. Get $5 off ANY Entrée at Sizzler when you join their e-club. To get a FREE Bloomin Onion with Purchase at Outback Steakhouse you just need to sign up for their newsletter. As a member you will all receive exclusive coupons that will be sent right to your email inbox. Get a FREE Dessert w/purchase at LongHorn Steakhouse when you sign up for email updates. Get a FREE appetizer or dessert with purchase of 2 Adult Entrees at Olive Garden when you create an account.